Millions of people now suffer from celiac disease and food sensitivity. But switching to a diet without gluten or dairy not only benefits those with gluten sensitivity or lactose intolerance, but benefits anyone who needs more energy, wants to lose weight, or simply craves a much healthier lifestyle. And now cooking without them is simple! You no longer need to give up the foods you love because with easy substitutions, some creative cooking, and the recipes in this book, you will still enjoy all your favorite foods. 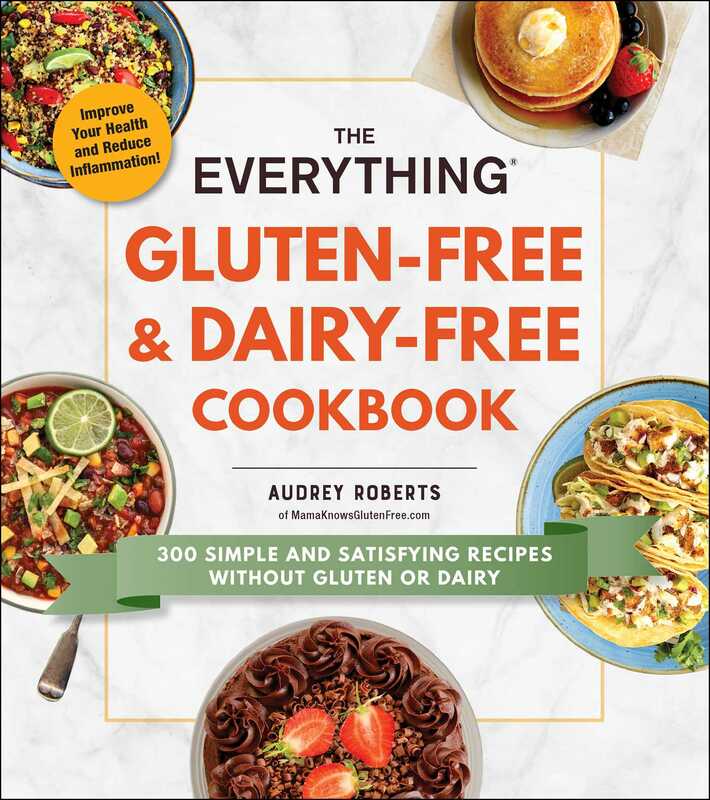 The Everything Gluten-Free & Dairy-Free Cookbook includes 300 gluten- and dairy-free recipes that your whole family will enjoy—from eggs benedict casserole to coconut cream pie. These easy and delicious recipes make it painless to start living a healthier life and feel better. Audrey Roberts, founder of the popular food blog Mama Knows Gluten Free, teaches you how to make the most satisfying recipes from breakfast to dinner and snacks in between meals. The Everything Gluten-Free & Dairy-Free Cookbook makes it easy to meet your family’s dietary needs while keeping them happy and healthy. Audrey Roberts is the founder of the popular gluten-free recipe blog Mama Knows Gluten Free, named one of the Best Food Blogs by Brand Ballot. Her blog specializes in affordable family-friendly, gluten-free, and dairy-free recipes made with simple ingredients. Audrey has been a featured blogger and guest at the Gluten-Free Food Allergy Fest and the GF & AF Expo, where she presented easy gluten-free and dairy-free cooking and meal planning tips. Her recipes have been featured on BuzzFeed, Women’s Health, Yahoo Lifestyle, and on major gluten-free brand websites like Schär. Audrey is also a guest columnist to the Tallahassee Democrat.